Start by asking yourself the following questions; how much space do you have? who are you trying to impress? how much time can you spend? do you want to build a replica of your own house? or a replica of a famous building? are you going to follow an existing template or make your own from scratch? If you aim for a more advanced house then you will most likely need to plan and create the templates which can be quite time consuming. Here’s a template for a more advanced house. However, if you want a simple standard house then you can find and use ready made templates. Once you have decided on the house and its size, you should think about the base and where to place it. For larger houses, you can take a stiff piece of cardboard to use as a foundation for your house. For smaller houses you could probably use a round cake board. If you need to move the house around, then consider something sturdier, especially if you have planned some fragile landscaping on it. If you can’t find an existing template for the house you want to create, then you have to do all the hard work yourself. You can either do the drawing in a house modelling program on your computer. SketchUp for instance is free for personal use, or you can just draw the house from all sides in the right proportions. Start with the biggest sections and leave the smaller details for later. Extra cardboard can be useful for trying out how it looks like when put together. It might also be a way to “design while building” if you don’t have a clear picture on how the house should look like. In any case it is recommended to build the house with the template pieces in cardboard and make necessary adjustments. Don’t forget to mark each piece clearly on where it should go. A tip is to write out which other pieces should be attached to each side of a piece. A standard size cookie sheet / oven plate is about the size of an A3 paper and if you want the template to be printable and reused you can try to optimize the pieces on an A3. The other benefit is that you know how to arrange the gingerbread pieces in order to have the baking done quicker. It is also a lot easier to use normal paper than cardboard when cutting up the gingerbread pieces. However, if you are building a larger house it could be an advantage to make a more sturdy dough. Here’s a gingerbread dough recipe that has been optimized for house building. If you have a cookie sheet with no sides, you can roll your dough out directly on it. If your cookie sheets have edges on them, turn them over and roll out the dough on the back. You can also have parchment paper between, but then you need to prevent it from sliding around. Here you can use a clean dishrag that you have soaked and then thoroughly squeezed out the water before placing under the parchment paper. Once rolled out evenly then place your templates on it to fit as many as possible in one sheet (but leave around 1 cm space between as they expand when baked). Cut around the templates with a sharp knife or pizza wheel. Don’t remove excess gingerbread until you have scored all pieces as it can cause pieces to move. Reuse the dough scraps in the next round. It is best to cut windows and doors prior to cooking. Tip: Give the appearance of a log cabin or wood siding by pushing into the dough before cooking. Bake the gingerbread pieces at least a day ahead of assembly, as the pieces need time to cool and harden. Standard oven baking time is around 15 min and at 175°C (350°F). Trim the pieces directly when you take them off the oven (they are still soft then) using your templates and a sharp knife. Then transfer to a place to cool completely. If you want more flat pieces then after they are trimmed then place a clean parchment paper on top and place cookie sheet with books on top. Let the pieces cool completely. Once the pieces have cooled and become hard enough you can prepare the “glue”. Most other recipes and guides use royal icing for this but there is a better alternative which is melted sugar. The benefits are that it sticks much faster, it is much sturdier and it is more “invisible” than the white icing. It is also really easy to do since the only ingredient is sugar and you only need to heat it until it is melted. Watch out so you don’t burn it and if you have kept it out of the heat for a while you might need to reheat it to make it more viscous again. Tip: use a big pot so you can dip the pieces in the melted sugar. Since you will be using melted sugar you will not have the problem of having to use different things to keep the structure fixed while the glue dries. Instead you can just hold the pieces together by hand for a few seconds. Just be very careful since melted sugar is very hot and you could sustain a serious burn if you spill it on your skin. You might want to keep the kids away for this step. Start by dipping the bottom edge of the back of the house in the sugar and place it at the back of your base (or where you want the house to be). If your base is very tight or if you are worried the house will not fit, then mark out in advance where the back piece should be placed. Continue with the piece next to the back piece and dip the bottom end as well as the side that should attach to the back side. You can also use a brush to apply the sugar. Keep going piece by piece. In case you notice that you need some adjustments after it has glued together then you are in a sticky spot.. What you can do is to use a dremel. 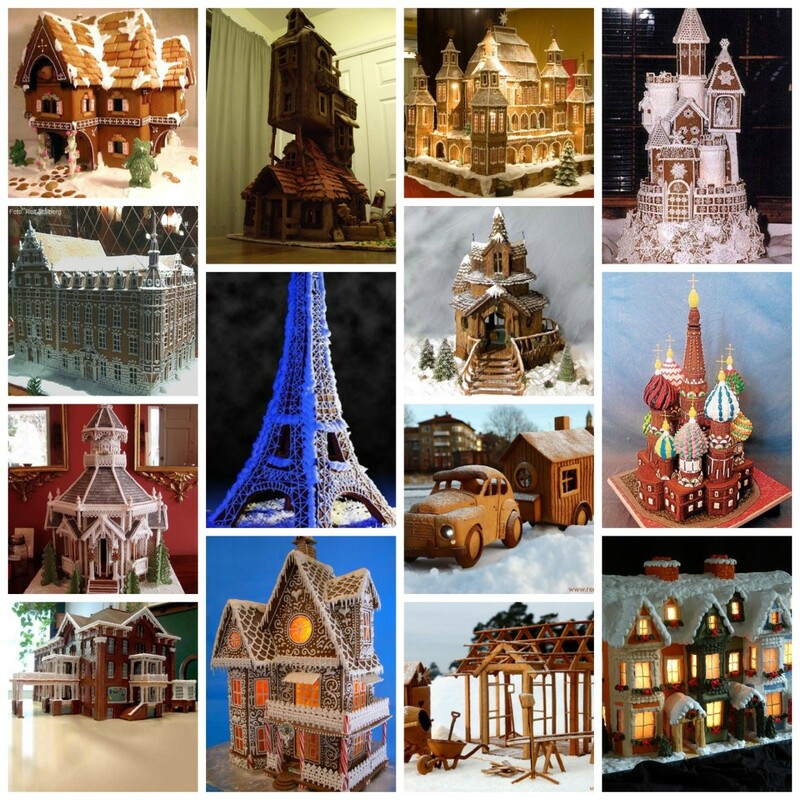 If you are not going to eat it and if it is a bigger structure you are making: Make a slightly smaller foam board version of the house and glue the gingerbread on it. We hope that you now know how to build a gingerbread house!